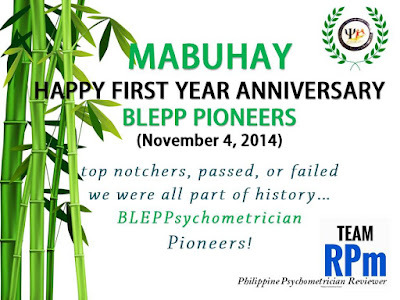 Mabuhay and congratulations to all pioneers of BLEPP 2014! Whether you topped the licensure exam, passed or failed, still, we were all part of history in the professionalization of Psychology practice in the Philippines.Although we were not able to make an anniversary post for the second year of our blog but we were able to make a second year anniversary post of our FB page showing the result of the survey conducted to assess and evaluate the page. For some of the 1,290 passers, job remain elusive. In particular for new graduates who are board passers feel they are marginalized despite their license as Registered Psychometrician (RPm) over those who are experienced but without license. There's a need for RA 10029-Philippine Psychology Act of 2009 to be fully implemented. It is appalling to note that some licensed Psychometricians are in a dilemma and feel apprehensive being victims or party to some companies unethical practice operating psychological testing clinics. As a response to licensed Psychometricians need for job we created Facebook groups for jobs postings and announcements we called Filipino Psychometrcians and Filipino Psychologists. 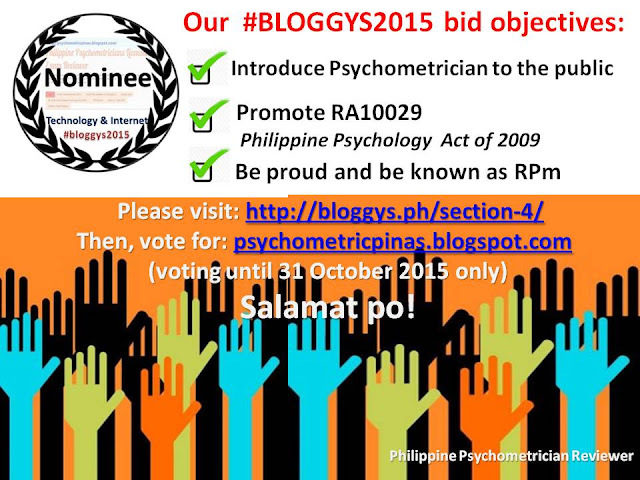 Also, #TeamRPm - our admin groups, joined the #bloggys2015 Philippine BLogging Awards to make our blog and FB page more visible to the public, promote for the implementation of RA 10029 and for RPm and psychology graduates take pride of their profession as Psychometricians. We are also very grateful for the endorsements we received from our friends and fellow bloggers and made a blog post about it. There were two BLEPP exams already the first in October 2014 and the July 2015. As we have seen there were improvements compared to the first BLEPP. But still we are hoping that information would be more accessible and available so we will be spending lesser time to respond to those queries and focus on providing online reviewers and quizzes. At least for 2015 the exam were conducted not only in Manila but in key cities like Baguio, Legazpi, Davao and Cebu. For the last board exam with a total number of 4,466 examinees in 2015, the number is expected to continue to increase given the number of those graduating from Psychology course. 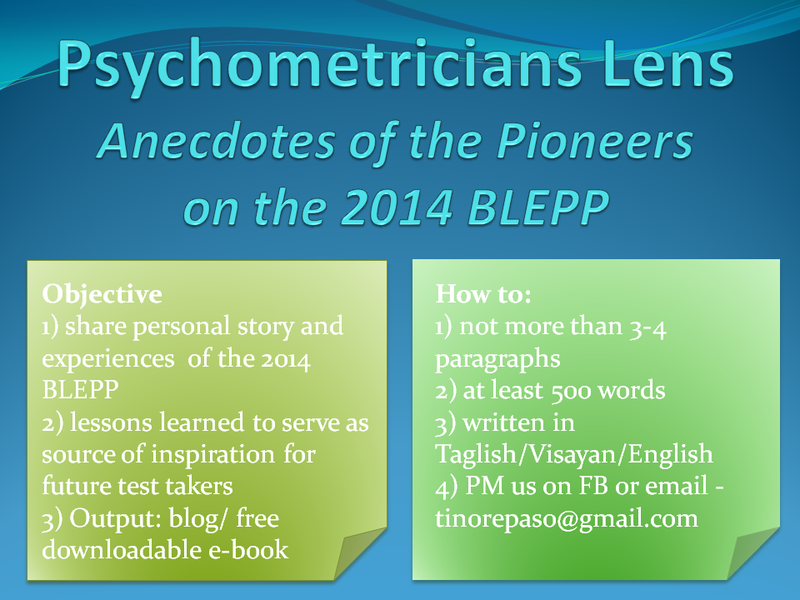 The number of those taking the licensure exam to become registered Psychologist is also increasing. The implication of this is shown with the trend of the increasing number of those taking their MA in Psychology. There's a need for universities to upgrade their facilities and improve their Psychology graduate program attuned to those required in the licensure exam. The Commission on Higher Education (CHED) should also compel universities to have universities comply in renaming and re-aligning their undergraduate courses compliant to the licensure exam for Psychometrician. Problem on course equivalency was such a big headache in the past board exams. Schools and universities should be constantly monitored and those consistent with a very low passing rate should be given warning. For those who are licensed RPm and RP they are required after three (3) years to renew their license. One of the requirements is for them to earn points for their Continuing Professional Development. As such we have created a page for Psych related events we called Psych Events Philippines. The objective is to monitor, document, share and spread Psychology and other related events happening in the Philippines. Let us know your events and we can post it here. So let us share and spread Psychology and other related events. Ask directly from the organizers about information and details like fees, venue, CPE points, etc. 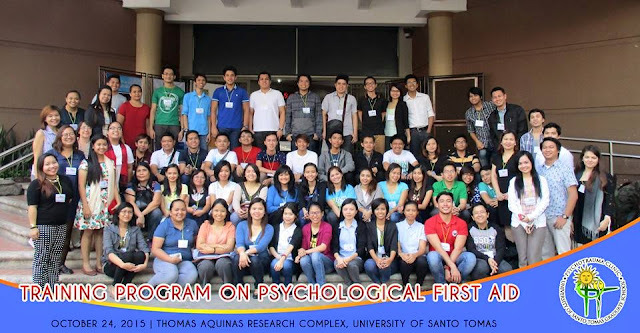 Since we now command more than 13K likers we were able to help disseminate information and ask people to sign-up for the Psychological First Aid training of UST-Psychotrauma Center. There are now more than 200 who signed up and 50 of them were given training. Reflections of some of those who trained was posted in our other blog. The FB group was formed with the following objective: Network, resources (information), education, training and other concerns on Psychological First Aid in the Philippines. The Philippines is a disaster prone country since it belongs to the ring of fire, frequented by earthquake, volcanic eruption and also battered by typhoons on a regular basis.To address a more holistic disaster-risk management, psychological first aid should go hand in hand.So this group is created for Psychologists and other volunteers to connect and provide assistance when needed. Let us serve as partner of Red Cross, DSWD, CSO/NGO and other relief/rehab agencies when they are mobilized in times of need. With our bid for the #bloggys2015 we got to know some friends and network abroad who even endorsed us. So it inspired us to create two more FB pages to network with our Asian and ASEAN counterparts to exchange with them on their practice of Psychology. Two years of our blogging effort and presence in social media like Facebook and Twitter, the task is daunting and challenging. But we continue to do what for us is a source of happiness and inspiration to be better Psychometrician and Psychologists - being of service to others. So as the number of our blog readers and FB likers increase we also continue to recruit admins. And we are very grateful to our indefatigable admins who continue to actively and creatively post engaging memes, videos, links and other updates. We continue to review and be entertained in our page. And we also encourage you our readers and likers to share as well and make our page and blog more SOSYAL (social)! 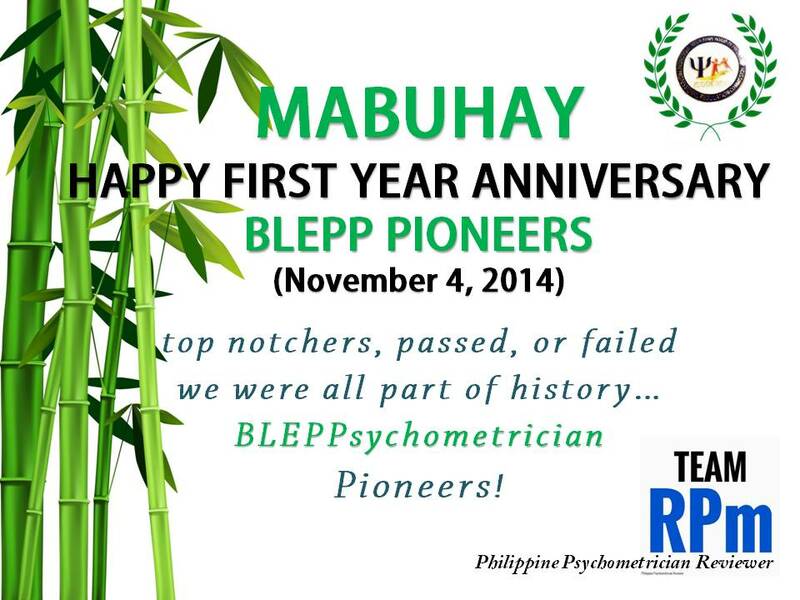 Happy First Anniversary Pioneers we hope that you continue to engage and share with us. Mabuhay!